Thanks to a partnership between the Library Foundation for Sarasota County and the Arts and Cultural Alliance for Sarasota County, children participated in FREE art workshops at their local libraries during the month of September. The explorations were more than just learning technique; the professional artists also explained the concept of their art form and the history. Kuniko Yamamoto enlightened families at Fruitville Library as she explained the history of Japanese origami. She taught how traditionally mothers and fathers handed down each origami to their daughters or sons. Kuniko provided a quiet setting for families to learn this art of folding paper. All ages had an enjoyable time using their imaginations. Teaching artist Scott Blum encouraged children to make some noise at Venice and Elsie Quirk Libraries! 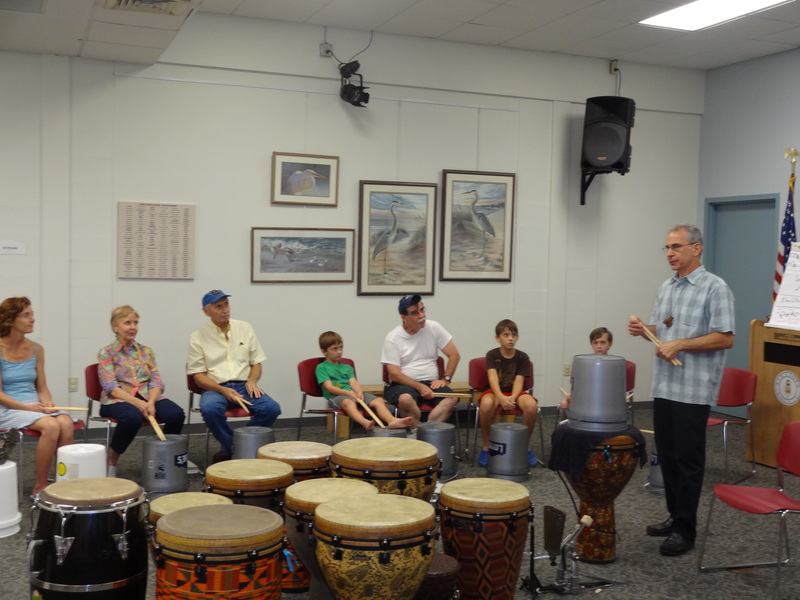 Scott taught the drummers the concept of Afro-Cuban drumming and about poly-rhythms. This drumming experience became an intergenerational event with instruments for all. The theme was: Reflections on Freedom: A Circle Poem, when young writers were inspired by artist Cedric Hameed at North Sarasota Library. Through a series of exercises, Cedric taught the art of creating poetry and performing spoken word. By the end of the workshop, each teen had completed a poem. Later that evening, several of the writers performed their original works. Lori Loveberry George taught young artists at Selby Library about ancient Egyptian painting. Using bamboo, palm fronds, reeds and twine, children learned how to make paint brushes out of materials found in the natural Florida environment. Coffee, food colors, and inks were the paint these artists used to practice making different marks. Lori Loveberry George also taught batik at North Port, Gulf Gate and Jacaranda Libraries. She demonstrated how to create different effects by pre-mixing or directly applying color over invisible wax resist. She shared a brief history of batik and taught about color theory. Children were able to create their own works of art.